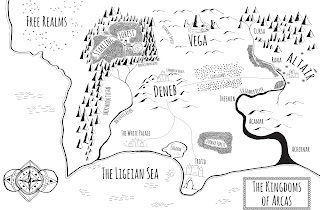 In Pursuit of My Own Library: Book tour for ARROWS OF DARKNESS and a free copy!! Book tour for ARROWS OF DARKNESS and a free copy!! It is the last day for the book tour of Arrows of Darkness by BI Woolet. You have already read my interview with the duo authors, but I have some extra goodies to get you excited for the latest release-including a copy of both Arrows of Darkness and The Hunter, The Bear and the Seventh Sister*. The contest will end on October 15th. Get scoring those points below for your chance at this great series! 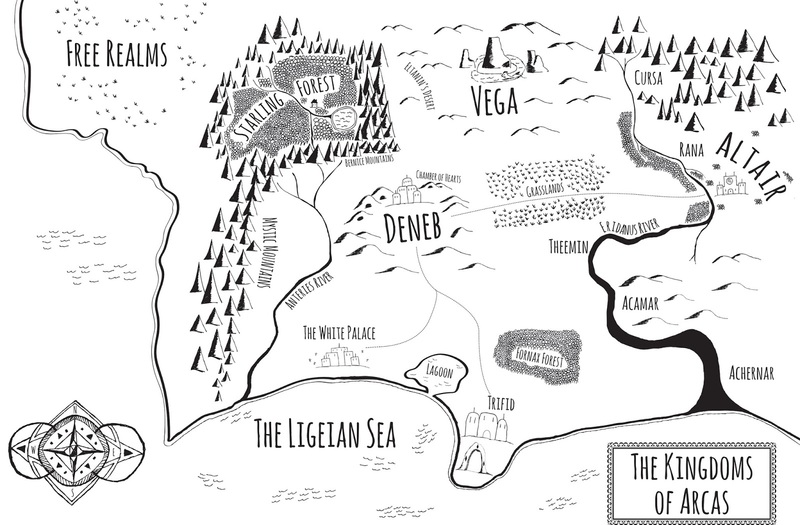 Follow along Jackson's journey with this great map of the land of Arcas. How about an article from the authors on their fantastic beasts? In The Hunter, the Bear, and the Seventh Sister, its immediately evident that Jackson has entered another realm when the white-winged Cygnus grabs him mid-air in the bright triune sunlight and safely lands him next to the little cabin in Starling Forest. After escaping the talons of a freakishly large black raven, Jackson then meets Otava. He’s a furry, talking brown bear inspired by Usra Major (the Great Bear in the night sky) and named from the Finnish word for the constellation. Though Otava is powerfully strong and well-armed with an arsenal of weapons, he’s also nervously paranoid, doesn’t like change, and loves cooking even more than his medieval artillery. Since the Big Dipper is also part of his constellation, Otava’s favorite soup dipper likes to enter the story often as a quirky astronomy joke on the side. He’s our lovable, loyal, but not-so-huggable big bear friend. Visit any of these great links for book trailers and exciting information about the World of Arcas series. Visit any of the sites below for more information and news about the World of Arcas, great book trailers, and where to get your copy of the books. Thanks for stopping by my leg of the Arrows of Darkness tour by Xpresso Books.